This quaint and inviting place prides itself on being Connecticut's first farm winery (established 1975). Come to Haight-Brown Vineyard, 29 Chestnut Hill Road off CT Route 118, a mile east of Litchfield, for a guided winery tour and wine tasting. You can also take the Vineyard Walk, a self-guided tour of the vineyards during which you can inspect the types of grapes which make Haight-Brown wines. Some of the favorite wines here are Covertside White, the table wines, a varietal Marechal Foch, a chardonnay, and a Johannisberg Riesling. There's even a sparkling wine made in the classic méthode champenoise. Admission is free, and wine prices are moderate. For more information on vineyards and wineries in Connecticut and indeed all of New England, visit SipNewEngland.com, the website about New England wineries. 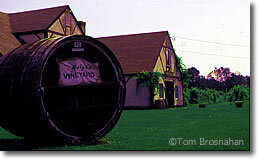 Haight-Brown Vineyard near Litchfield, Connecticut's first farm winery.